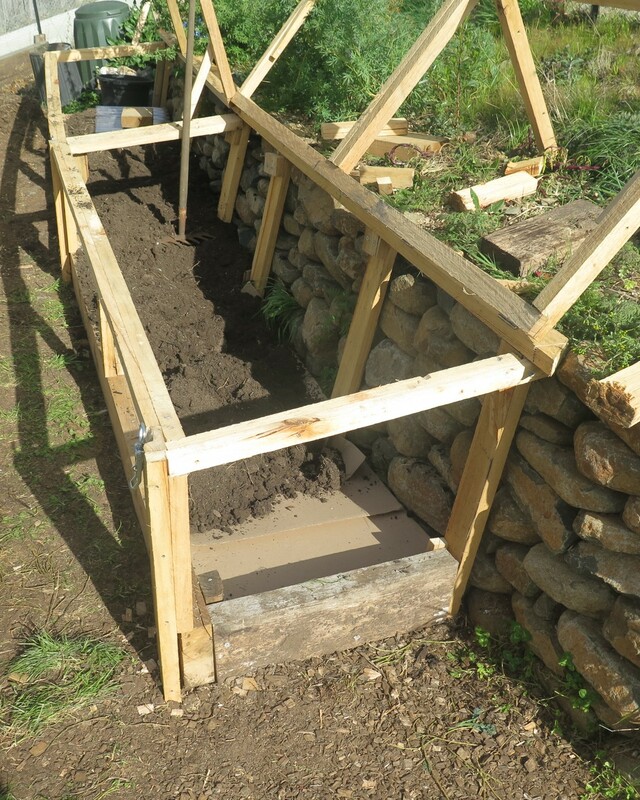 Recently, we built a much anticipated, beautiful bit of infrastructure for our garden – a cold frame. 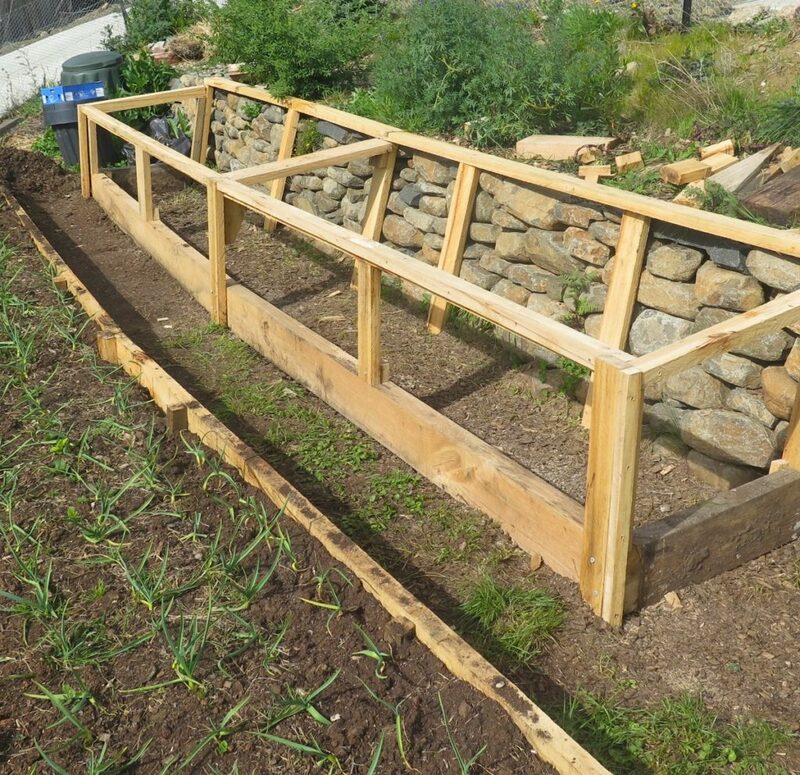 This is a welcome addition to any cool temperate garden, where we’re all constantly working on creating warm microclimates to extend our season to get tomatoes earlier and longer, reliable eggplants and abundant basil. 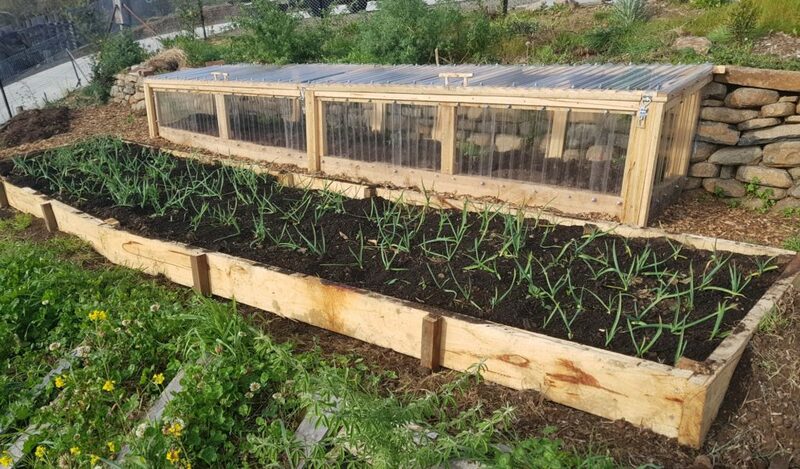 Cold frames can be really compact and small, so are also a great option for people who don’t have a large enough space for a hot house or polytunnel. We still have plans for a hot house one day (specifically for oranges and bulk ginger), but in the meantime we have this 7m x 1m cold frame for annual vegetables and herbs. What did we build it from & where did we locate it? We built it from green (fresh) hardwood timber from a lovely bloke’s bush block in Franklin (southern Tasmania) and polycarbonate sheeting. We located it up against a north facing rock wall (south facing for folks in the northern hemisphere) so it soaks up the hot sun and acts as thermal mass, retaining the heat for longer to benefit the crops growing in front of it. Eventually it will rot – but not for around 10 years (approximately). If you can access it and afford it, Cypress macrocarpa timber is the most durable timber to use in the landscape. We couldn’t afford it, so are using a mixture of Eucalyptus trees. 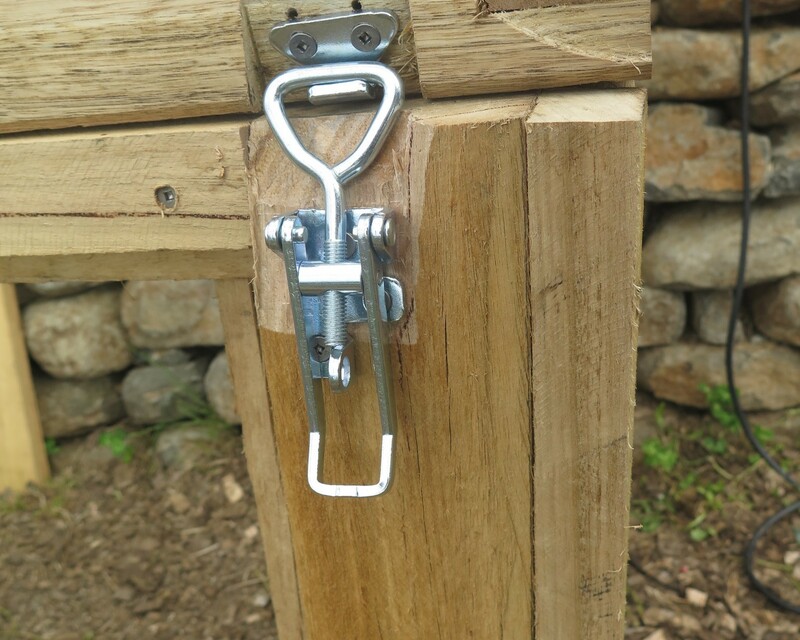 To extend the timber’s lifespan, you can line the sleepers with non-toxic plastic to prevent direct contact between the timber and soil. While not shown in these photos (sorry) this is what we’ve done. 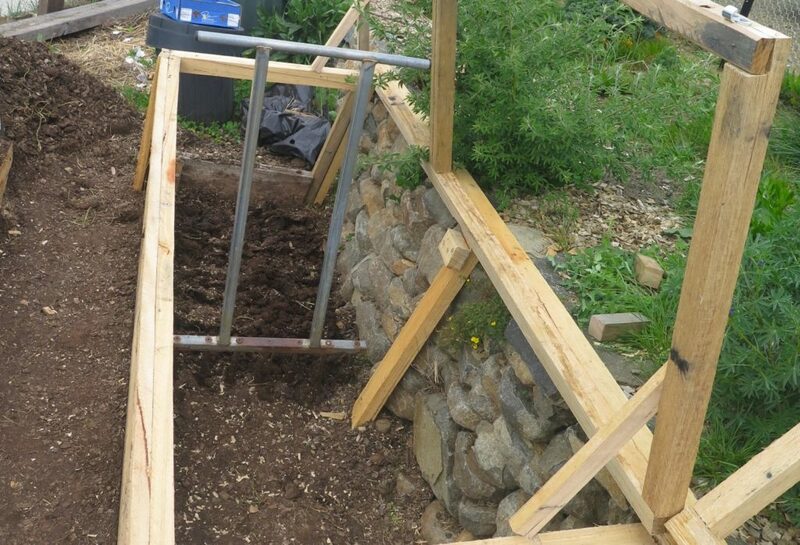 We’ve built the frame so the timber sleepers can be removed and replaced as needed. The actual frame has separate timber pickets on each upright to stabilise the whole frame (seen in photo above right). 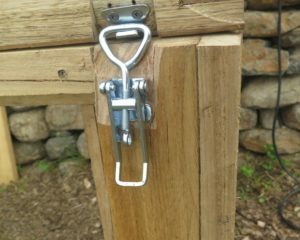 Eventually we’ll replace these with steel star pickets – again to extend the life of the frame. 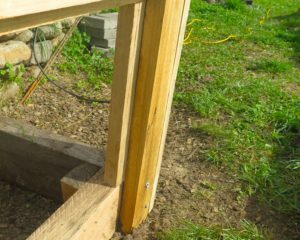 You could just not use timber and use bricks/stone for the edging and steel for the frame with concrete footings – all maximum durability! We’re just using what we have available to us. 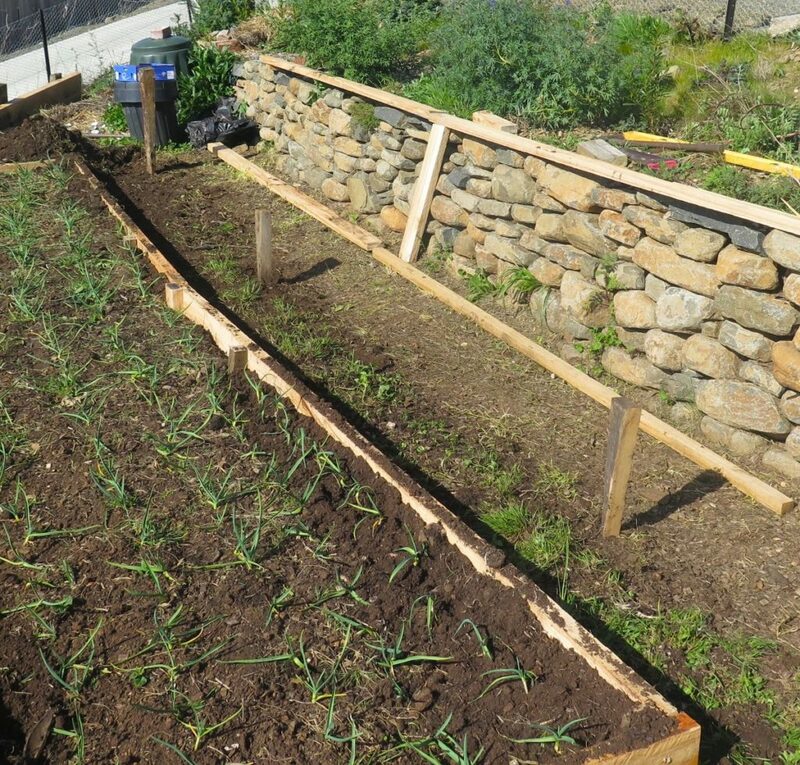 Once the whole frame is built, we aerated the soil with a broadfork – just use a standard garden fork if that’s all you have. 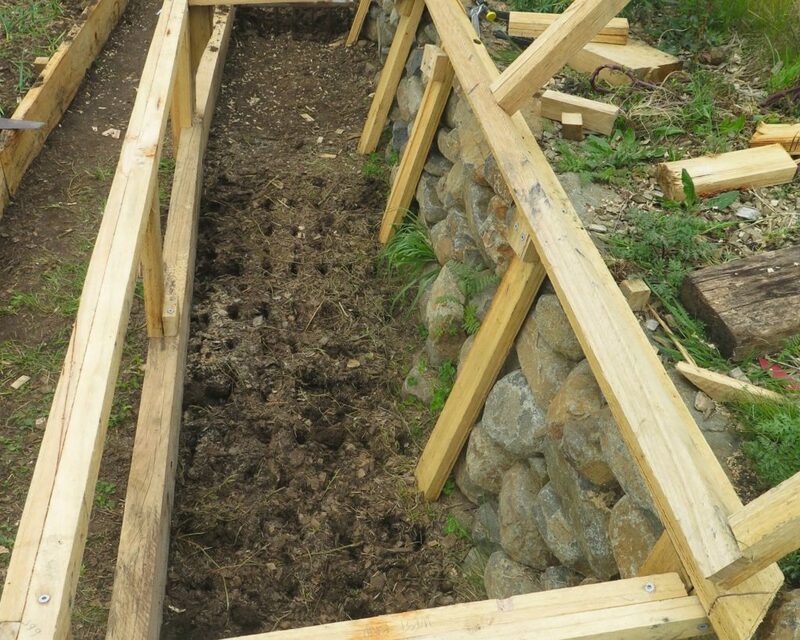 After this aerating process, we put down a layer of cardboard to slow weeds coming back (they *will* come) and then a good layer of top soil around 200mm deep to match the height of the sleepers and a sprinkle of compost on top. Normally people in Tasmania plant their tomatoes after “show day”, October 25th. Traditionally this is when you can safely say there’ll be no more frost – although occasionally there’ll be a “freak” frost. 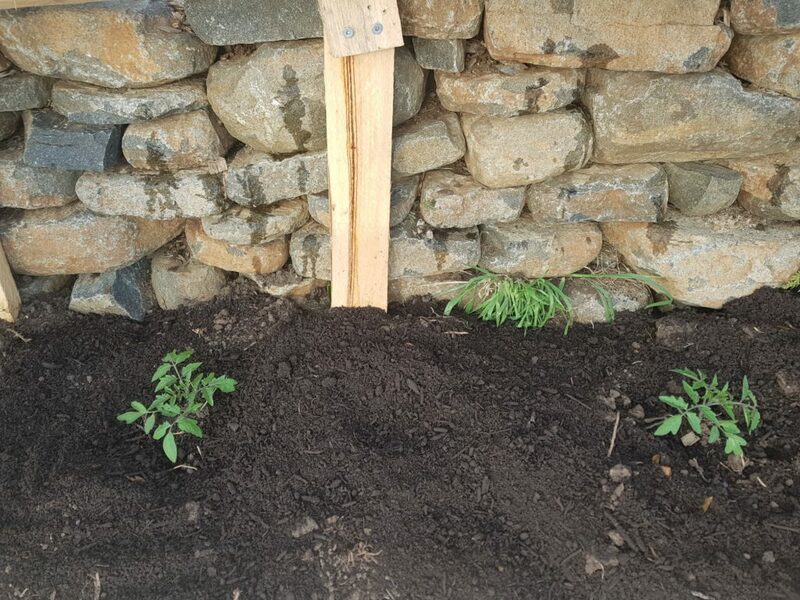 This year we planted a small batch of tomatoes on September 21st. One whole month early – we have big smiles on our face in anticipation of eating tomatoes sooner rather than later. We have another batch of tomatoes we’ll plant after show day in different open air garden beds. 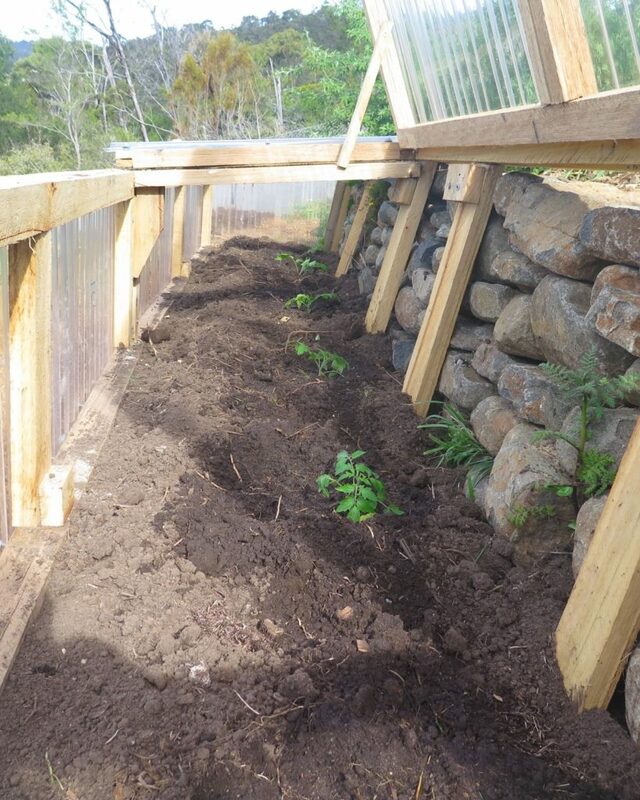 In another few weeks, we’ll plant basil seedlings all around these tomatoes to make use of all the available space. Importantly, the lids can open at different heights to let small or large amounts of air in. This is important as on hot, sunny days you need to ensure that air flow is maintained, otherwise there’s the risk of fostering fungal diseases. As we get really strong winds at our house we put a lock on each lid. 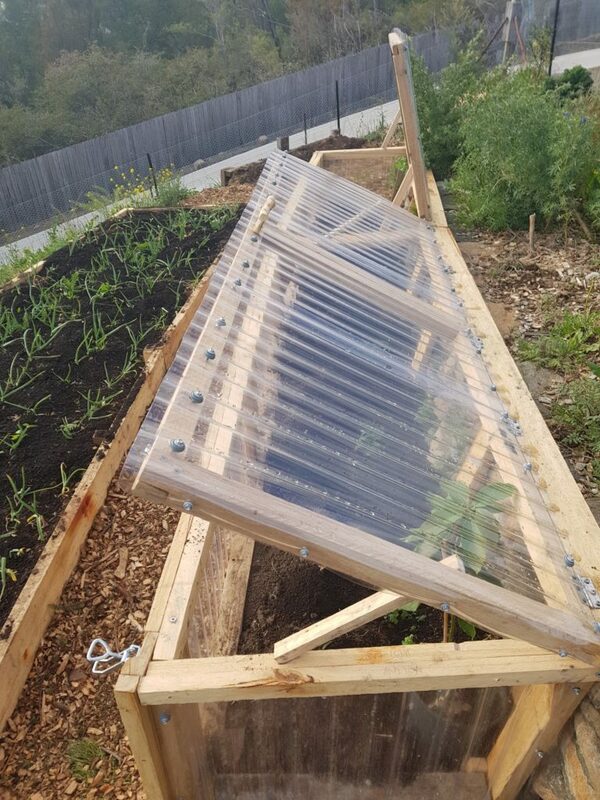 One year our whole broccoli crop was literally blown out of the ground – so we take our wind-proofing pretty seriously around here. You can see our lock of choice to the right. Eating with the seasons is a wonderful way to eat. That first tomato of the season tastes really *amazing* after 6 months of no fresh tomatoes. But this little bit of infrastructure reduces that waiting time – some might call it cheating, we just call it clever :-). 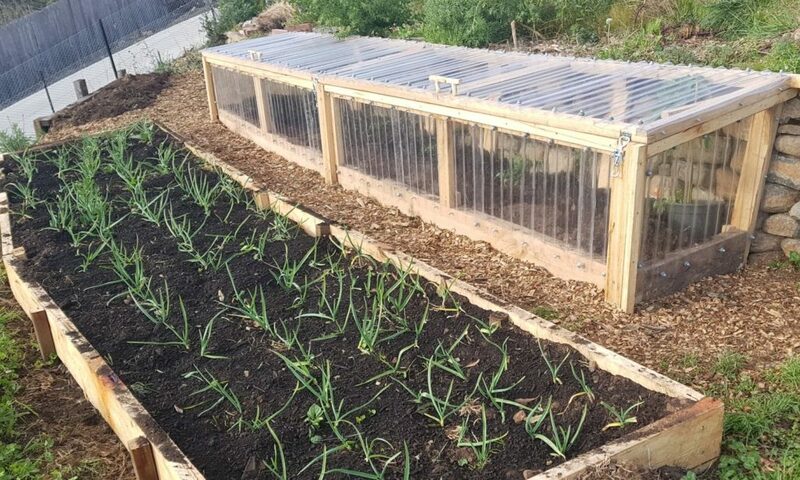 Edit (March 2019) – If you would like to see how our cold frame went for its first season, read our other blog here. How To Make Bees Wax Wraps! 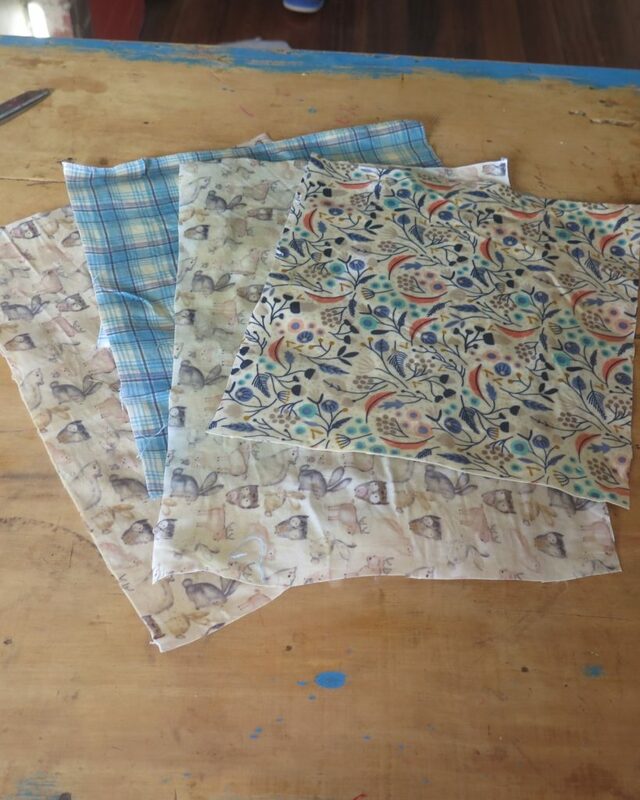 We’ve been using beeswax wraps for quite a while now and like them so much we decided to start making our own. We’ve tried two approaches, the first just 100% beeswax from our beehives and the second with beeswax, pine resin and olive oil. The wax and resin makes a better wrap, albeit with a bit more work… Tally ho, here’s what we did. 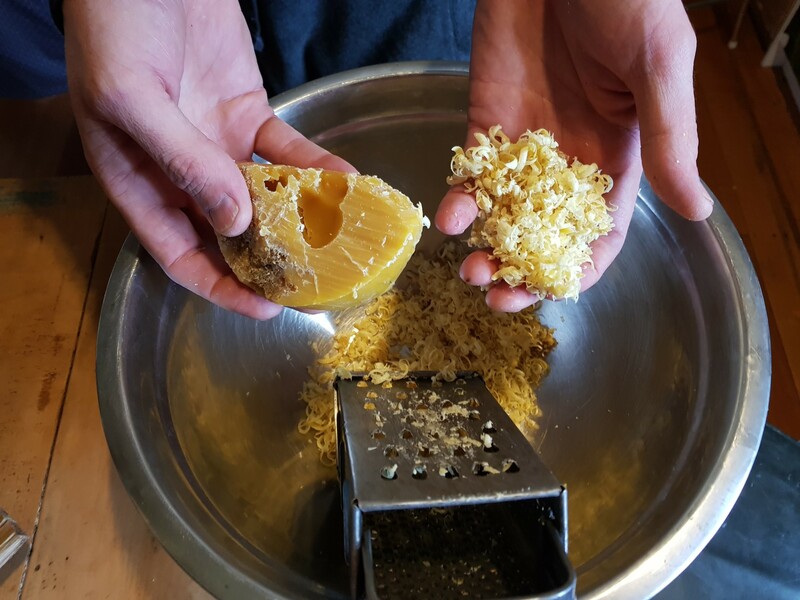 Beeswax is harvested from our bees. 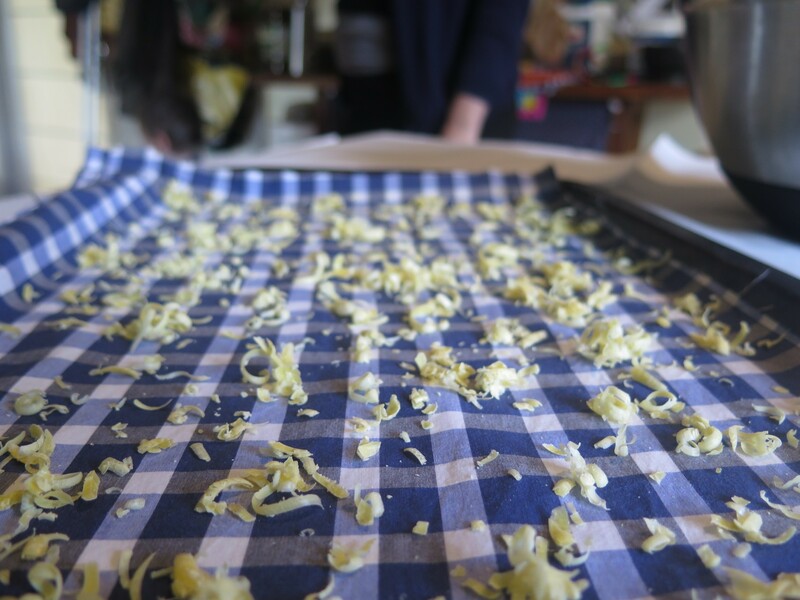 We melt the harvested wax with water then sieve through a sieve then muslin. 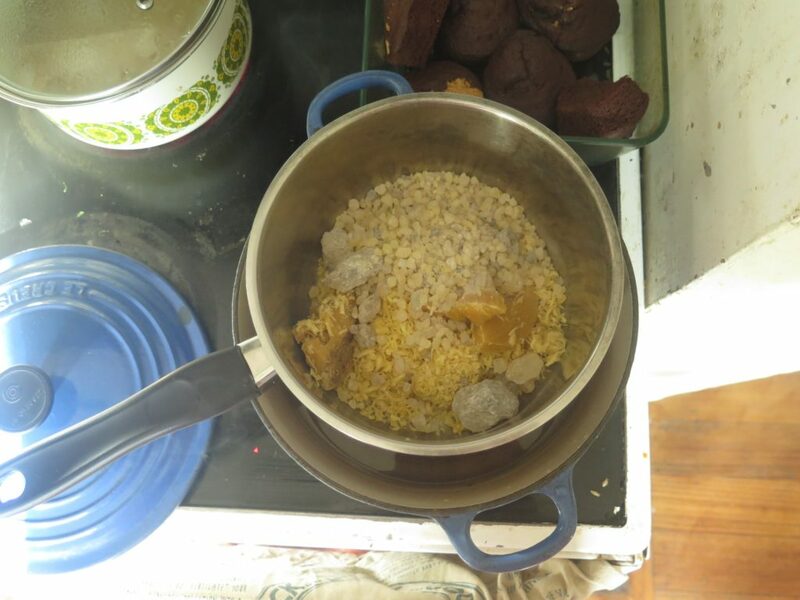 Let set and drain off the water, This leaves fairly clean beeswax. You can also just go buy some. 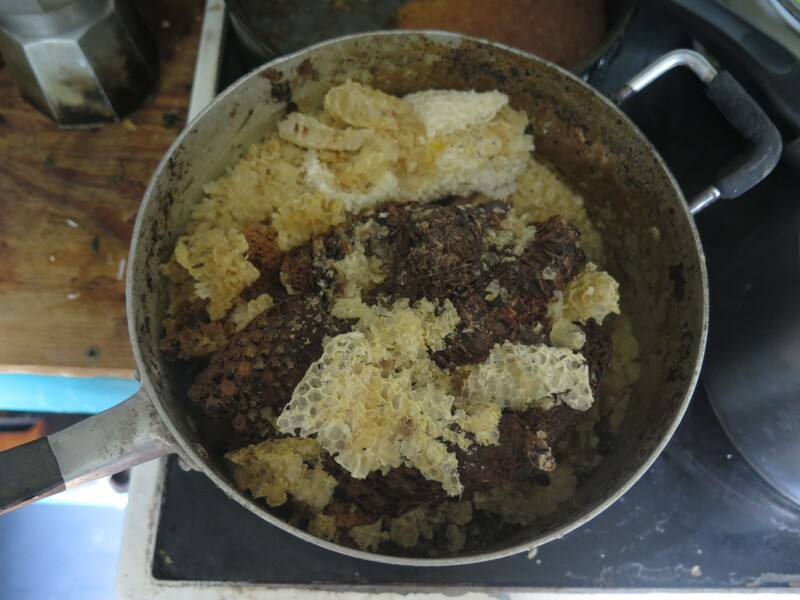 That yucky wax and cappings and occasionally dead bee turns into clean wax, ready to be grated. 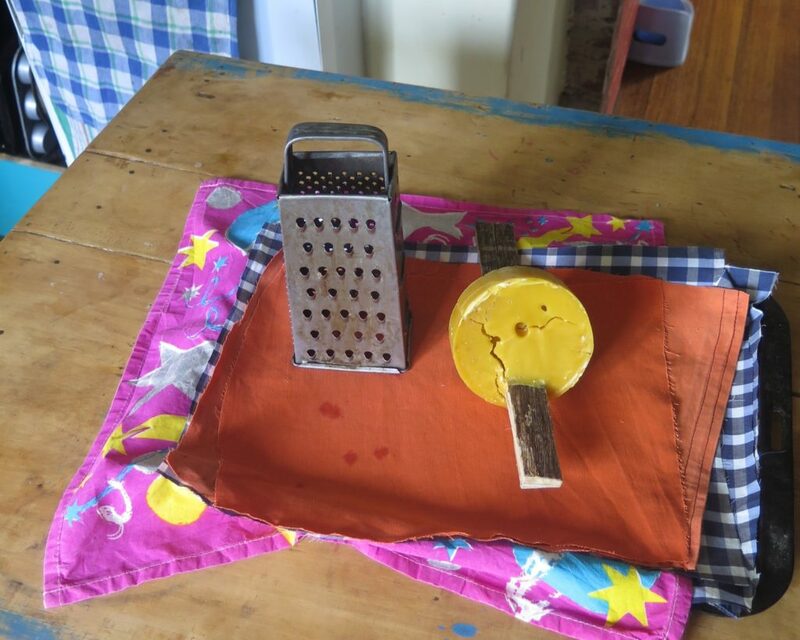 We experimented with simply grating beeswax on some cloth and putting it in the oven. 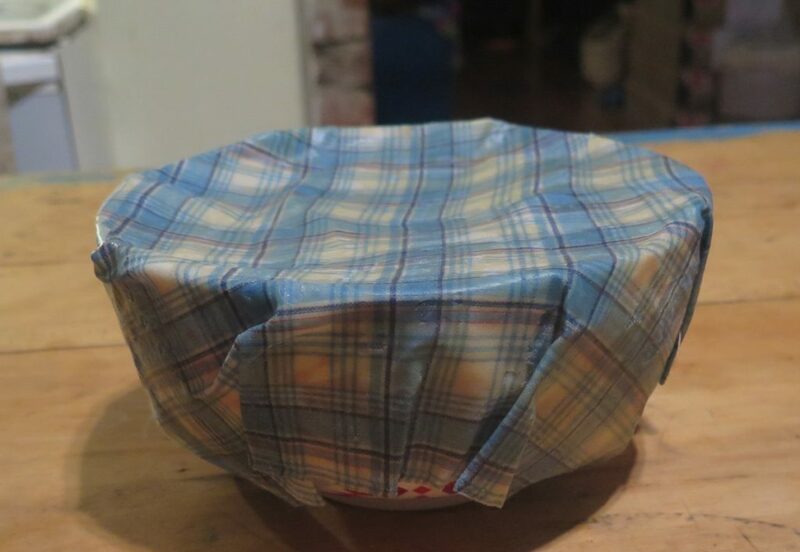 Simple, a beeswax wrap. This works, however it’s as sticky as we’d like it, being unable to mould and stick to complex shapes. 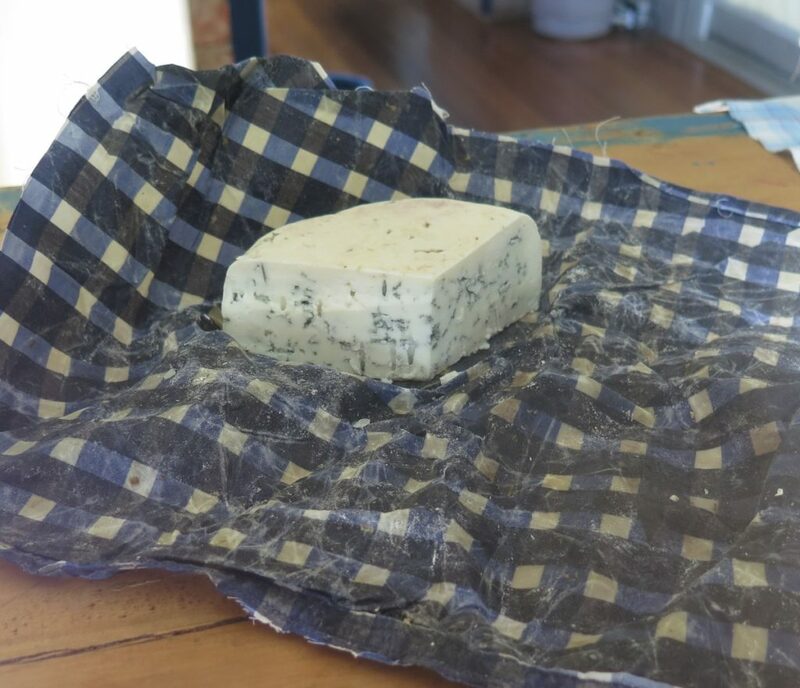 That said its good enough to keep a blue cheese in a carefully colour-coded blue wrap. 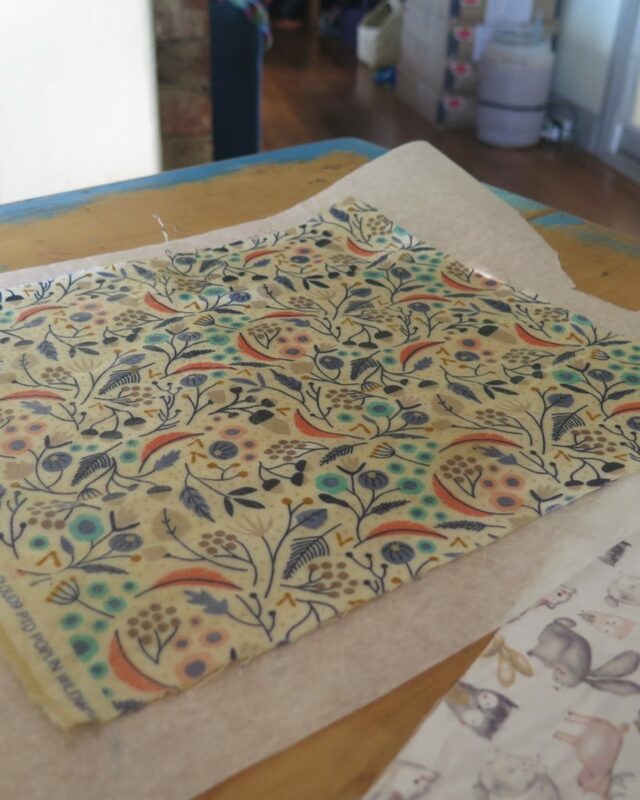 Enter the beeswax and resin wrap. 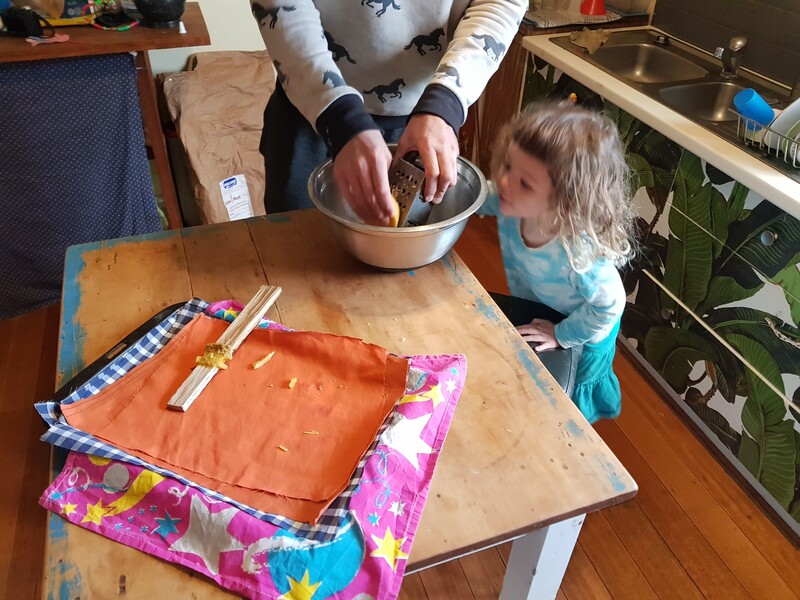 Mixing beeswax, pine resin and a bit of olive oil creates a superior wrap. The method is fairly strait forward. Pine Resin is the sap of pine trees that is used as part of its healing process. 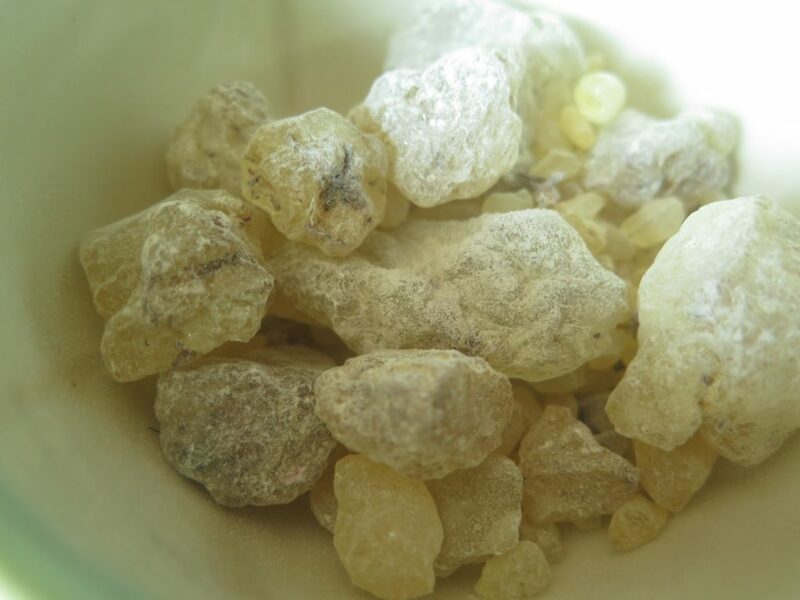 You can harvest your own which we tried by visiting various pine trees in the hood and scraping dried globules of wax. It was pretty slow going for me (not that many pine trees around here) and harvested around 50 grams in an hour. At some point, I decided to go and buy some from the art supply store for $50 for 500 grams. Enough to last us a loooong time. The wax, resin and olive oil is is placed in a jar or saucepan in a double boiler (another saucepan of water). It takes a few hours for the whole mass to incorporate. The pine resin forms a toffee like texture for a while before dissolving into the wax. Once the mixture is melted and combined it can be used immediately or stored for later, simply re-melt at a later point. The fabric. 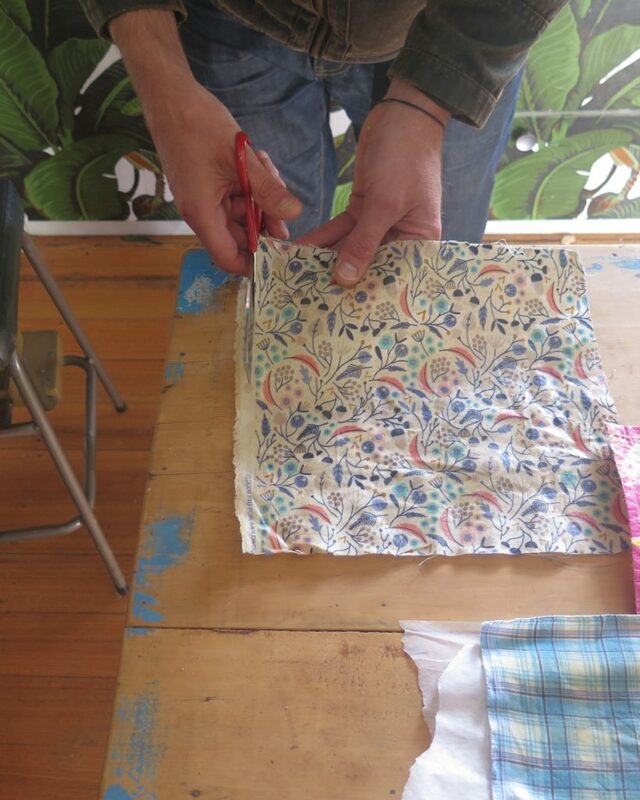 We searched the material box and also scoured the tip-shop for nice cotton scraps (thanks to our friend Tom who works there). We washed the cotton and dried each piece of material. 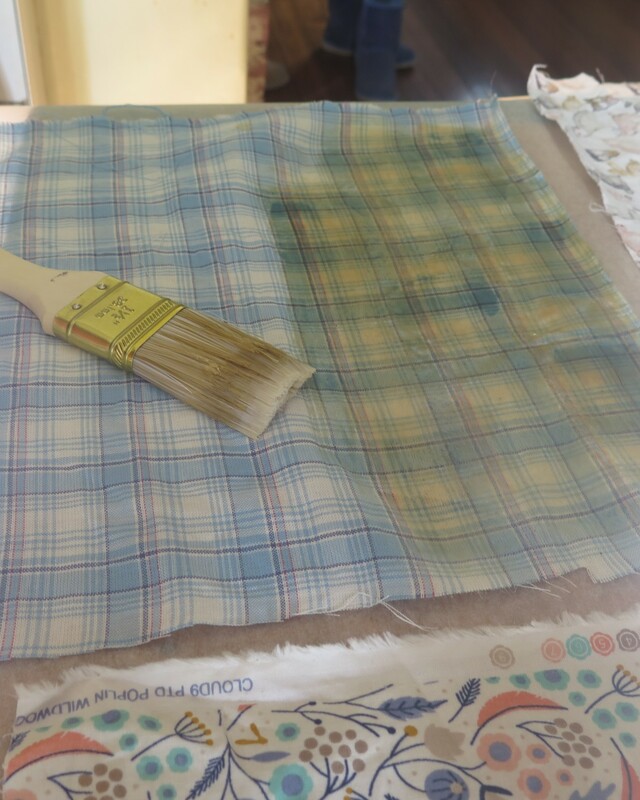 To apply the wax mixture we used a paint brush to paint onto the cotton. 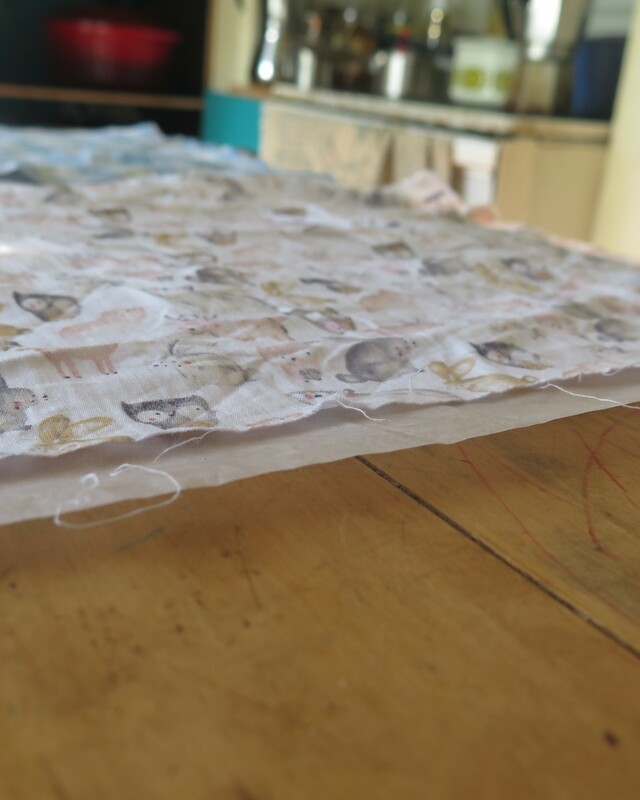 Under each section of cotton we put some greaseproof paper to stop it sticking to the table. On some materials the wax mixture did not penetrate the material. We placed each wrap in the oven at 100 degrees C for around 5 minutes. This let the wax mix fully into the wrap. How cool is this stuff. Its tacky, its sticky, it moulds to shape and holds in place. Oh, it smells kinda nice too, a bit like a sauna 😊 Maybe we should make some for christmas presents?